A Tennessee man was held without bond Sunday night on a first-degree murder charge after he allegedly opened fire while wearing a mask at a church outside Nashville, killing one person and injuring six others, authorities said. Police found four guns believed to be Samson's, the statement said — a rifle and a pistol in the suspect's SUV, along with two other pistols — in Burnette Chapel Church of Christ in Antioch, where Melanie Smith, 39, was killed as she walked to her car shortly after 11 a.m. Shooting suspect, Emanuel Kidega Samson. Nashville police spokesman Don Aaron said that after fatally shooting Smith, the gunman entered the main sanctuary door, at the rear of the church, and "began indiscriminately shooting." A church usher, Caleb Engle, 22, confronted the gunman and was "pistol whipped," Aaron said. "There was a significant struggle between the two," he said, adding: "During the struggle, the gunman shot himself, probably not intentionally, in the left pectoral muscle." Nashville Police Chief Steve Anderson said of Engle on Sunday afternoon: "He's the hero — he's the person who stopped this madness." Engle, a licensed gun owner, went to his vehicle, retrieved his firearm, returned to the church and "made sure that the gunman didn't make any more movements until the police department arrived," Anderson said. In a statement, Engle deflected credit for stopping further violence. The church's minister, Joey Spann, and his wife, Peggy, were among the injured, Nashville Christian School said in a post on Facebook. Joey Spann is a Bible teacher and coach at the school, according to the statement. Other wounded attendees included William Jenkins, 83; Marlene Jenkins, 84; Linda Bush 68; and Katherine Dickerson, 64. The Memphis office of the FBI and the U.S. attorney's office for middle Tennessee have opened a civil rights investigation. They declined to comment further. Samson is believed to have come to the United States from Sudan in 1996 and was a legal U.S. resident but not necessarily a citizen, Aaron said at a news conference Sunday evening. 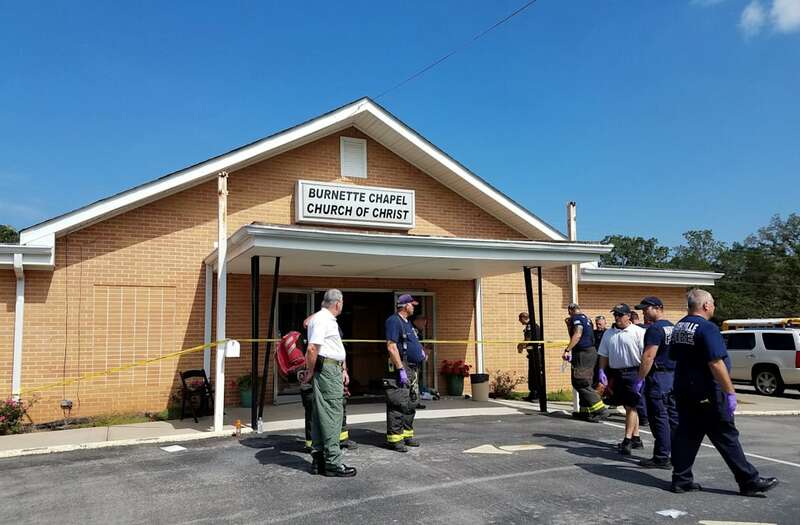 Aaron had said earlier that police weren't aware of any relation between the gunman and the congregation, but he said Sunday evening that some churchgoers recognized his name and said he had attended the church about a year or two ago. "They did not know who it was until they heard the name, and some of them gasped when they heard the name," Aaron said. Kenny Love, a Nashville-area singer, said he went to high school with Samson and was "heartbroken" over the news. "I was on Facebook and then someone said there was a shooting, and then they said the shooter was Emanuel K. Samson, and I said please don't let it be my friend," he said. "But then I looked, and it was, and I started crying. I couldn't believe it." Love said that Samson didn't have any obvious mental issues and that the incident didn't make sense. "Only thing I can go off of is maybe he spoke to somebody who got into his head. He wasn't big on religion. I think maybe the devil got to him," he said. "Or maybe he was going through something and no one knew it." Five shooting victims and the gunman were treated at Vanderbilt University Medical Center, said John Howser, chief of the medical center's communications office. By Monday morning, one patient was in critical but stable condition, according to the medical center. The four remaining patients were all listed in stable condition. The gunman was apparently wearing "a type of neoprene mask," Aaron said, adding that it was the kind of half-mask a skier might wear. "This is a terrible tragedy for our city," Mayor Megan Barry said in a statement. "My heart aches for the family and friends of the deceased as well as for the wounded victims and their loved ones."